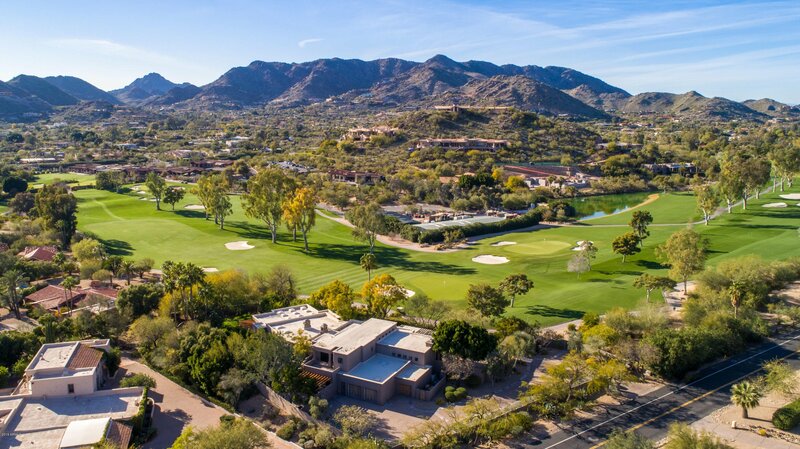 Absolutely STUNNING renovation of this timeless Paradise Valley Country Club Golf Course Double Gated Private Estate. Expertly designed for the current owner by renowned architect Bill Tull, this home is truly a work of art. Enter the private courtyard as you are greeted by the colorful lush grounds gazing across the perfectly manicured fairways to the surrounding mountains. Tull's SW artistry is found in the signature curved walls, flagstone and wood surfaces, 4 sculptured fireplaces, rare Sabino wood cabinetry, custom carved interior wood doors and massive beam ceiling details. The expansive walls are the perfect canvas to showcase the finest art collection. Spacious open floor plan includes massive great room/dining/den combo open to extraordinary chef's kitchen with antique finds incorporated throughout, new appliances, custom island, wine fridge and disappearing walls to both the front and back patio areas. There are 3 bedrooms plus separate office with en suite baths and open to outdoor patios/balcony. The grand master suite overlooks the rear grounds and is accented by the massive fireplace. The separate his and her bath areas offers her side with all new finishes throughout with Travertine accents, custom lighting, new champagne bubble tub and two huge closets with skylights. His side offers large glass shower, soaking tub, two sink areas, another large shower and a private door to adjacent office/den. Split on the main level is one secondary guest suite. Upstairs find a charming loft adjacent to upstairs guest suite with private balcony leading to the sparkling all tile pool and spa with waterfall and cozy fireplace sitting area. The magical home is a special classic jewel and sits on one of the most prestigious sites in all of Paradise Valley. It truly is the definition of comfortable elegance.